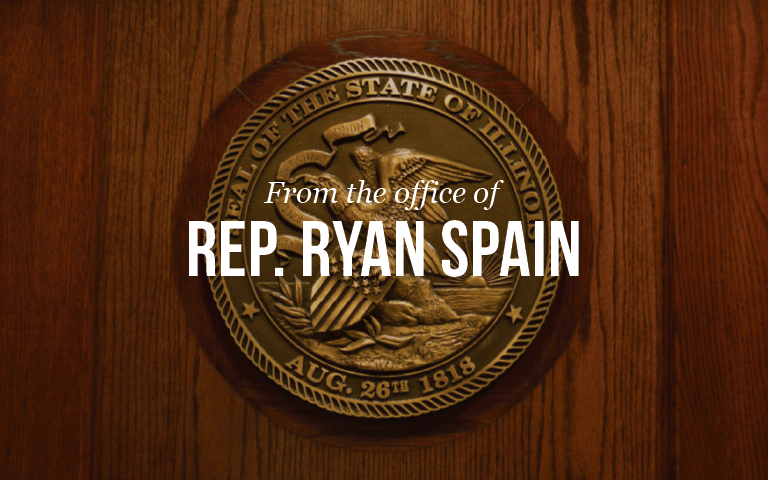 State Rep. Ryan Spain took little time in Springfield after inauguration to sharpen criticism of the process by which legislation is considered and debated in the Illinois House. “The current House Rules stifle democratic debate- plain and simple. The rights and responsibilities of legislators to represent their constituents and attempt to pass legislation on their behalf has been under attack for decades under these rules. They are designed to allow the Speaker, alone, to have complete control over what bills are even debated or assigned to committee in the Illinois House. That must end to allow our state to move forward,” said Spain. Under rules proposed by Speaker Madigan, and rules that have been in effect under his previous tenure, he alone has control over the daily agenda in the Illinois House, which bills are allowed to be even assigned to committees, and how that debate is to be conducted. “It is no secret that Speaker Madigan controls the agenda in Springfield, but whenever people ask how it can be stopped- this is it. The House Rules are the mechanism by which this control is exercised. Whenever you hear of a good bill proposed and later hear it went nowhere- it’s likely because of the Illinois House Rules and Madigan’s single-minded priorities that are, alone, represented,” continued Spain. Under a counter-proposal supported by Rep. Spain, public posting requirements would change to require more than one-hour notice for consideration of legislation, the power of lame-duck legislatures would be limited (like the one that passed a 67% income tax increase in 2011), and additional transparency and public notice requirements for the business of the Illinois House would be required. In an irony not to be lost on Illinois taxpayers, that counter-proposal was not released from the all-powerful House Rules Committee. The House Rules supported by Speaker Madigan passed 63-53 with no Republican support.